It the final years of the last century, I was amazingly fortunate to be working at Detroit Edison / DTE Energy when the transformation from “an Oracle shop” to “a Java shop” was being implemented. DTE’s CIO had the connections and insight to bring a wonderful group of people from the outside world in to mentor those of us on the inside, people who, a decade later, I still like to keep in touch with (Mr. Tibbetts, Mr. LeJacq, Mr. Meyer, etc.). One of these wonderful people was Mr. Boutros, who flew in from his home in Montreal every Monday morning and back every Thursday night, if memory serves. I definitely remember the Monday mornings because that was when Stephane introduced us to Montreal bagels. As a native Michigander who had worked primarily in downtown Detroit until that point in my career, I had never even known that a Montreal bagel existed. 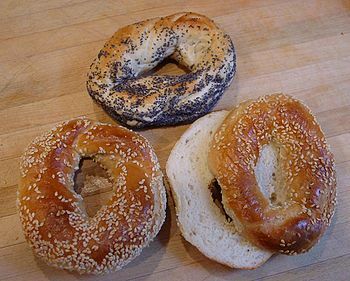 Steph would bring in bags full of these bagels, which had been baked that morning at Beaubien Bagel (he picked them up at 5am), flown down to Windsor, and then trucked over the the border in the Tunnel Bus to DTE’s HQ. They were well-traveled bagels. More importantly, they were fantastic. Sesame-seeded with a bigger-than-normal hole, they resembled an oval salt pretzel, but were sweet and denser. Fresh bagels were fantastic right out of the bag, and the development team would hail Steph and start devouring handfuls of bagels and cupfuls of the French press coffee we made every hour. (I guess, looking back, we were a high-maintenance technology team.) Whatever we didn’t eat that day were fantastic the next, toasted with cream cheese. These bagels have been favorites of mine ever since, and certainly their place in my gastronomic memory and heart was concretized by the unique person who introduced them to me. I have gone to great lengths to get to a Montreal bagel since then. A few years ago, my wife and I went to Montreal to celebrate one of our wedding anniversaries. We stayed at the charming Auberge de La Fontaine, which I recommend for its location, comfort, and, naturally, the fact that they serve Montreal bagels for breakfast. Others have also gone to great lengths to acquire them for me. The two oldest and most popular Montreal bagel bakeries are Fairmount and St-Viateur. Until recently, neither of them shipped to the US, unfortunately, so I had to hire a few gentlemen from Canada (Mr. Purdie and Mr. Tontodonati know who they are) and then have the bagels shipped to their homes so they could bring them to me, good men and great friends that they are. Finally, at least one of these bakeries is now shipping directly to the US. It is not inexpensive — it looks as though the shipping is just as much as the bagels themselves — but they are certainly worth it. I was never very good at geography, but I have learned that the heart and the stomach have a good memory for places. You heart knows where home is, where it was broken, where it has soared. Your stomach remembers where it has eaten well, whether it was breakfast in Traverse City at The Omelette Shoppe, the world’s best cafe mocha in Ann Arbor at Espresso Royale, a traditional Coney Island miracle at Detroit’s American Coney Island, or what I believe to be the best bagels in the world. This entry was posted in Montreal Bagels and tagged food, LinkedIn by Roger Valade. Bookmark the permalink. Great story Roger. I too fondly remember the bagels Stephane brought from Montreal. However, bringing bagels took on a different meaning when it was the punishment for breaking the build. I tried to track down Stephane a while back with no luck, are you still in touch? Can’t remember if I ever replied to you offline, Eric, but, yes, Steph and I are still email buddies. Let me know if you need his address. Thanks for the tip, Montreal Gurl. I’m always hopeful that Beaubien will start shipping this way, but until then I’m open to all the available options! Whenever possible, I would intercept Mr. Boutros at DTW for a still-warm Montreal bagel. I think that I especially did this after I resumed my weekly travels to DetroIt to work at OnStar in 2001.